LABOR’s agriculture minister-in-waiting, Joel Fitzgibbon has shut down speculation that his party’s intention to close live sheep exports out of Australia within three or four years will inevitably lead to similar actions on live cattle. Joel Fitzgibbon addresses Thursday’s Queensland Rural Press Club gathering. “The Labor Party supports the live cattle trade, unequivocally,” he told the audience. “It’s a $1.2 billion industry which is vitally important to those producers in the north, and on that basis I don’t see any challenge to its ongoing viability. It’s also important to our relationship with Indonesia,” Mr Fitzgibbon said. “But what worries me is that our political opponents continue to use live export as a political issue, saying that as sure as night follows day, Labor in government would abolish the live cattle trade next. It isn’t going to happen,” he said. “I believe that if done well, we can help the industry transition to something better – in particular, domestic supply chains, domestic processing and value-adding – the things that create jobs here in Australia,” he said. “Eight months on, the industry has voluntarily suspended much of its operations, and is attempting to embrace new regulatory measures that are in fact much tougher than those it would have faced if it had moved earlier,” he said. He said attacking and demonising those who raised environmental and animal welfare concerns, while defending the status quo, had proven to be a failed strategy. Mr Fitzgibbon said there would always be those on the extreme left with multiple agendas. “We’ve seen some examples of that of late, and I will stand with the ag sector to stare them down, if we must. But we have to be careful to differential genuine mainstream concerns from those with extreme agendas,” he said. 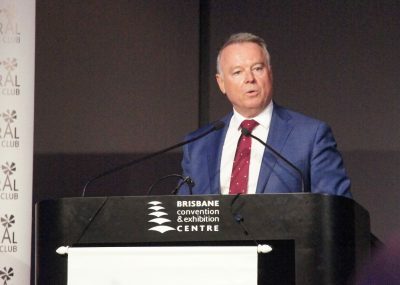 With a Federal election bearing down and an overwhelming opinion that Labor will sweep to power in coming months, Mr Fitzgibbon delivered a broad ranging address, touching on key rural issues including access to labour, tax reform, energy costs, foreign and other investment capital and a suite of issues close to the bush’s heart. “Labor’s agenda for the upcoming election is pretty simple, and quite clear,” he said. He said there were many ag-specific policy issues to be addressed if Australian agriculture was to realise its ambitions to embrace all the opportunities that were before it, and overcome the associated challenges. Mr Fitzgibbon said the coalition government could not have done more, over the past five years, to stand in the way of capital inflows into the ag sector – particularly from countries to Australia’s north. “A Labor government will never play politics with foreign investment rules – it’s too important an area for populist policies,” he said. “Industry expert Gary Weedon last year said in an ABC interview that returns were quite low in agriculture in relation to the risks and volatility of the investment. We should all reflect on that deeply and regularly – we should not kid ourselves about the realities of some of the challenges we face in this regard. Fogging up their reading glasses were two key common concerns – perception and risk. “It’s doesn’t help us at all, or encourages domestic foreign investment,” Mr Fitzgibbon said. Rising community concerns about the treatment of animals and the health of Australia’s natural environment. Trade exposed industries could only compete if governments kept costs down, Mr Fitzgibbon said. “Costs like energy are key issues for the agribusiness sector, and a Shorten Labor government would deliver an overdue architecture change for our energy system which gets investment flowing again and drives costs down,” he said.